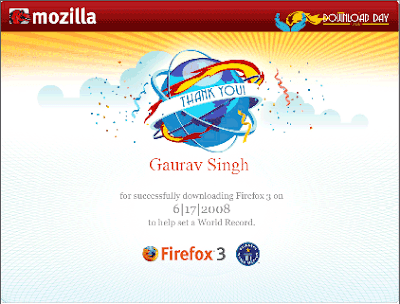 So you may have downloaded FireFox 3 by now and if you haven't you should download it right now as today is the FireFox3 download day, and you can be a part of it by downloading it in the 24 hr download time set by the Mozilla authorities to set up the Guinness World Record for the most downloaded software in 24 hours. And it would be up to the users to make FireFox 3 a hit or just an over-hyped product, as many people had complained about its stability in the Release Candidate Stages. and those who wish to flaunt that they have downloaded FireFox 3 can get their personalized Certificates from here: Get Your Certificate.